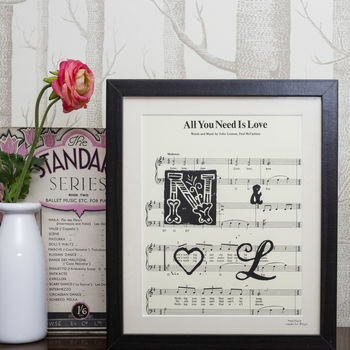 Meltingly romantic- give a beautiful and unique personalised picture of your special sheet music handprinted with two initials, a heart and an ampersand. Something Wonderful Design's best-selling piece and exclusive to notonthehighstreet, this is a stunning and very personal piece of artwork to treasure. 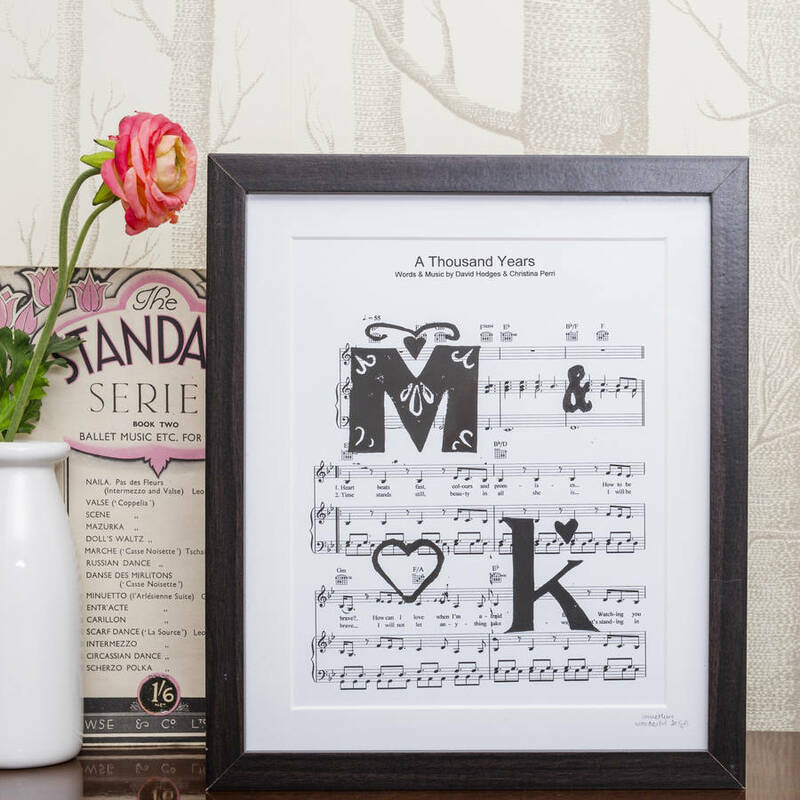 Handprinted onto your choice of sheet music with two initials and your choice of heart, ampersand or both, every poster is made to order. 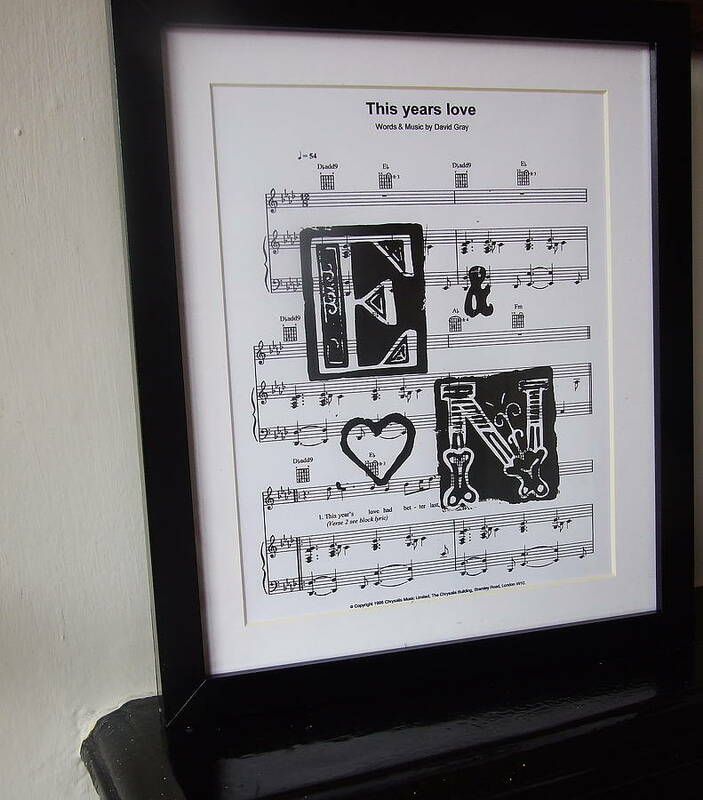 Your special song can be transformed into a very personal work of art, ideal for a romantic Valentine's or anniversary gift, and a perfect wedding or engagement present. The first dance at your wedding, the song you fell in love to... just let me know what it is, and I will find it for you. 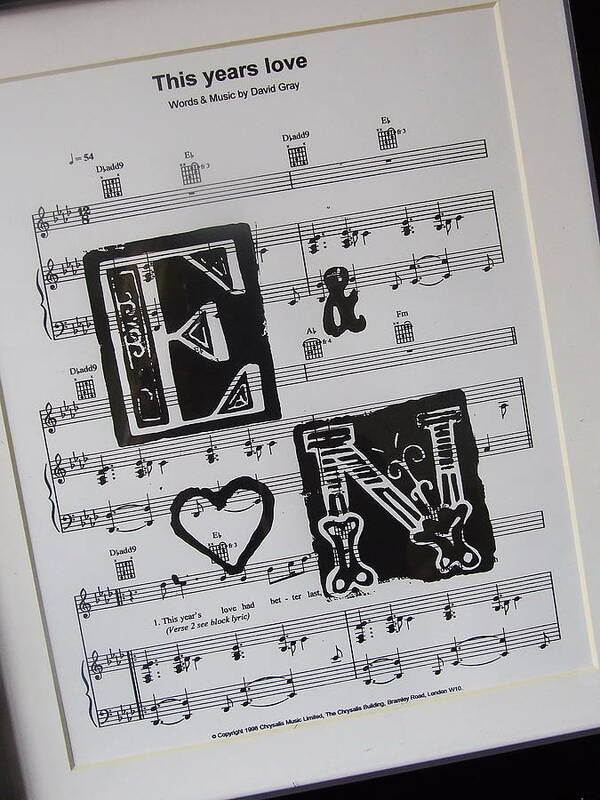 The initial letters are printed from original linocuts, with each letter of the alphabet in a unique and beautiful style. 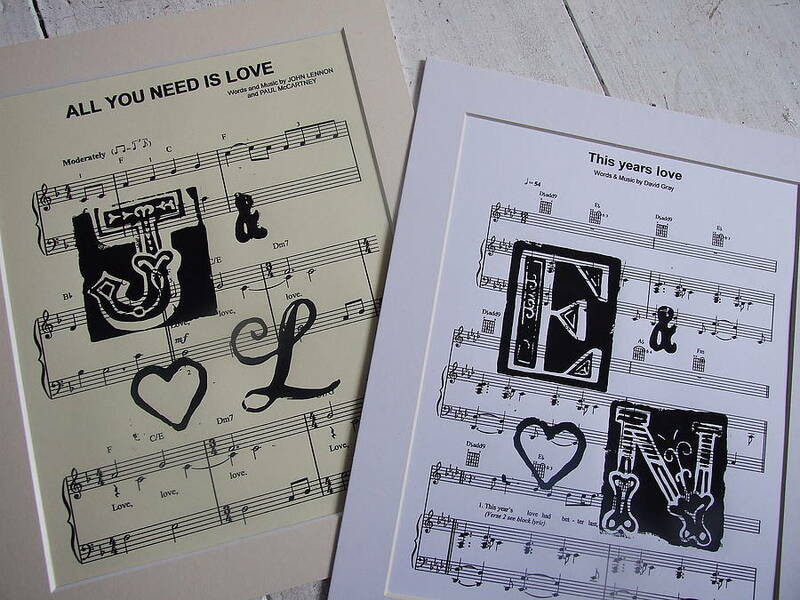 The poster is printed in black ink, either on contemporary white or vintage style cream. The song page will be the first of what is usually several pages of sheet music for your song, so though it will include the song title and songwriters names, it will not show the complete song. There are lots of framing options- simply choose your preferred option from the drop-down list. Framed prints come with a matching mount, or you can have the print sent ready mounted and buy your own frame- the mounted option fits perfectly into a 10 x 12" size frame, which is easily obtainable. Finally you can have your print sent loose (but in a protective cellophane sleeve of course) perfect for easy posting. 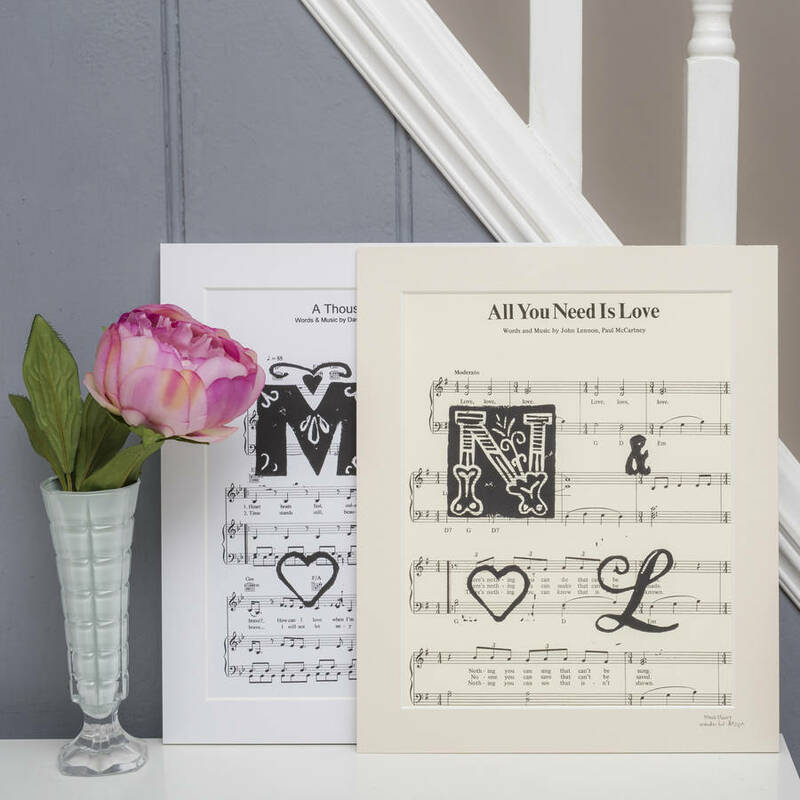 I will make every effort to source your special song; in the unusual circumstances this is not possible, I suggest the 'Love' Handprinted Vintage Music Poster, which is available on Express Delivery. I will confirm your order once I am certain I can obtain a copy of the sheet music. If you would like your print giftwrapped, all wrap comes with a handprinted tag. Please let me know at the checkout. Handprinted in waterbased artists ink on card. Dimensions: mounted / framed size 25 x 30cm (10 x 12"), unmounted size is A4. Print size varies according to the initials and details selected.